Kincardine Ontario Canada is found on Lake Huron between Goderich and Port Elgin, accessed via Hwy 21. This port town's history is rich dating back to 1848. The first post office and first grammar school in Bruce county originate in Kincardine. 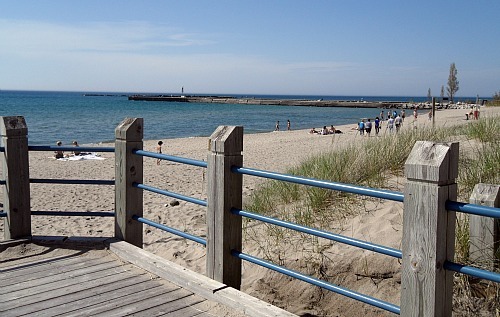 But these days many think of Kincardine as a beach town that thrives in the summer months. One of the most popular attractions in Kincardine is the cobblestone Harbour street which of course leads down to the town's harbour. 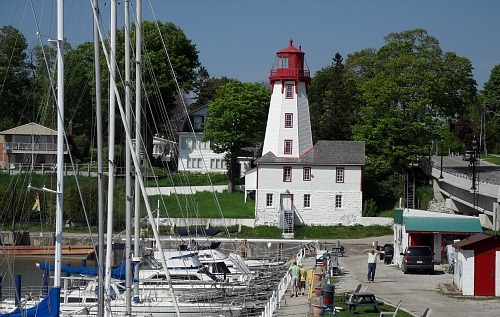 It also leads to the lighthouse and the historic Walker House, the oldest standing hotel in Grey Bruce, which now houses a museum dedicated to the town's history. There is also a satellite of Southampton's Bruce County Museum at the base of the lighthouse which is open July 1st to Labour Day. There are multiple beaches in Kincardine Ontario Canada. The main beach is known as Station Beach and is adjacent to the marina shown above. This dune beach features shallow gradient waters that make it a great day for family beaching and plenty of room to find a spot on the sand. 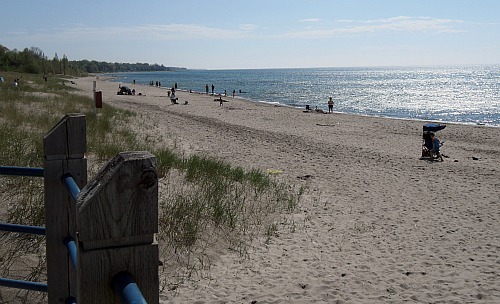 Other local beaches include Boiler Beach (take Goderich Street to Boiler Beach Rd) and Lorne Beach (Take Lorne Beach Rd to the water), but due to its proximity to Kincardine's other historical landmarks Station Beach is the most popular. This cottage town isn't just about beaching or home to Bruce Power workers, it also boasts The Kincardine Music Festival which runs from July 31st to August 13th 2011 and features 2 weeks of concerts from some of Canada's finest professional musicians. The Kincardine Music Festival is a music camp by day, allowing young musicians the chance to develop their skills plus a chance to perform, followed by the concert series at night. Kincardine also features Music in the Park, every Wednesday in July & August. In addition to all the music Kincardine is also home to the Bluewater Summer Playhouse which shows live theater productions in July & August. If you are staying in or near Kincardine (Inverhuron Provincial Park is extremely close by) you can find the majority of Kincardine restaurants along the main thoroughfare; Queen Street. There are also some familiar chain restaurants up on Hwy 21. This cottage town truly thrives year round but has so many summer attractions you will want to add it to your list of places to visit in Ontario's Cottage Country. Return HOME from Kincardine Ontario Canada.